Despite being a community of less than three thousand, Minden boasts the honor of being Nebraska’s Christmas City, the home of Pioneer Village and also home to the SomeRset card game. Hodges is said to have invented the game in 1903 and published it for many years under The Somer’R’Set Card Company, Chicago, Illinois. After copyrighting ‘Some R Set’, it is reported that he received royalties for many years on sales of the game. Around 1934, he sold the rights to Parker Brothers, who published it until about 1960. The game of Single SomeRset, created by Hodges, consisted of 28 somerset cards. In 1913, the game evolved into Double SomerRset and was played with a 50 card somerset deck. In 2009, Jerry Childs of Ludington, Michigan created a variation called Triple SomeRset using a 92 card deck and can be played by 6-8 players. Rick Johnson, owner of the Minden Hardware store, purchased the copyright to the card game when he purchased the Coast to Coast store from Jim Runions in 2004. Runion previously held the copyright which he purchased in the 1970s. The object of SomeRset is to take as many points as the bid without being too optimistic and going set, thus the name ‘somer are set’. There are no face cards in a SomeRset deck. The deck consists of 7 suits pictured as fractions. The numerator (top number) is the value of the card and the denominator (bottom number) is the suit. One card in each suit has an extra value in counting the score, the count card and is in red. There are two extra cards in the deck, the S/S and the 0/0, that have special privilege. There are several versions of the rules of the game which have been archived by Jerry and Gail Childs of Ludington, Michigan. The Childs and Wiersma families own and maintain a website devoted to SomeRset and Jerry Childs is credited for the Triple SomeRset version. According to research done by the couple, the first rules were published by the originator of the game, Arthur Hodges in 1913. Parker Brothers, after purchasing the copyright from Arthur Hodges, published a set of rules in 1947. Minden Hardware currently publishes rules for the game included with the cards. The Minden Senior Center has its own variation of the rules. An additional version of the rules is published by a Kansas City company and a web site, boardgamegeek.com. Stop by the Minden Senior Center any afternoon and there will be a game of SomeRset going on. 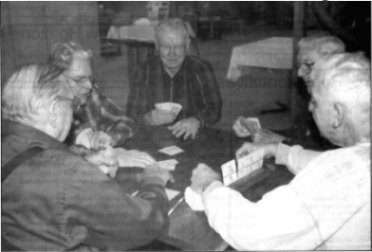 The game has been played for decades in Minden and remains one of the many things that makes the community unique. Copyright © 2010, The Minden Courier.